We left you off yesterday with an end of an overview of the East Liberty neighborhood. Now we will cover what I initially set out to write. The green domed building is the building. In front of it you can see a wall that a beautiful mural was painted on. This picture is from March of 2014. 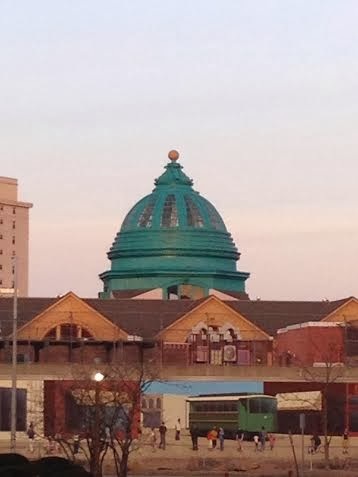 The dome is currently under restoration, a great sign for the future of this building. Fitting to the Baum Boulevard Auto Row, this building houses an office for AAA. From 1898-1900 this fascinating looking building was paid for by Andrew Mellon and commissioned the firm of Peabody and Stearns from Boston, MA. It was called the "East Liberty Market House," and did not last long as a retail space. In 1915 this building would be purchased by the Pittsburgh Auto Association for auto shows in the newly booming automotive market. 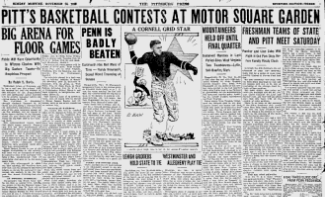 Pittsburgh Press, March 20, 1920: Notice it is still "Pittsburg" without an h.
By the time 1920 came around this building was actually used as one of the first indoor sports venues in the city. Pitt Basketball would use the building as their home court until the Pitt Pavillion opened up underneath the old Pitt Football Stadium in 1925. Aside from Baseball, the most popular sport of that era was Boxing. This was a famous venue for that sport. 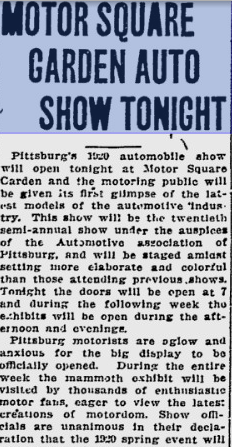 Here are a few news clippings from the Pittsburgh Press from the 20s and 30s about the venue. It is mind blowing how much further we have come in regards to race. This Pittsburgh Press article from January 7, 1928 is pretty depressing to read. 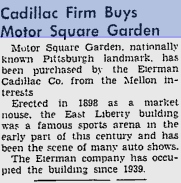 Eventually this building was converted into a Cadillac Dealer as a part of Pittsburgh's Baum Boulevard Auto Row, where there was once a Model T Assembly Plant, along with a Studebaker Assembly plant and a whole row of dealerships as seen in this Pittsburgh Press Article from 1947. In 1988 a shopping mall and AAA location were placed into the building. The mall flopped but the AAA is still there. You can still go inside and it is pretty cool. 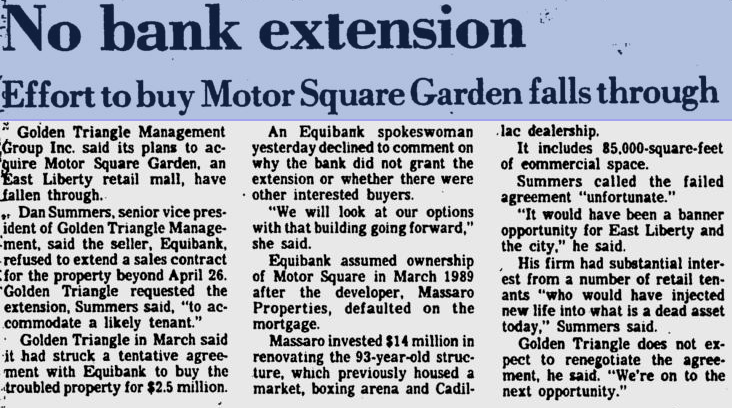 This Pittsburgh Post-Gazette article from 1991 shows how this building has faced uncertainty for a good part of the last three or four decades. This building has suffered similar to the way the neighborhood around it has. The AAA in the building has provided certainty to keep the building going. If you are ever in East Liberty, check out this cool building. It is definitely one of the more interesting works of architecture I have ever seen.